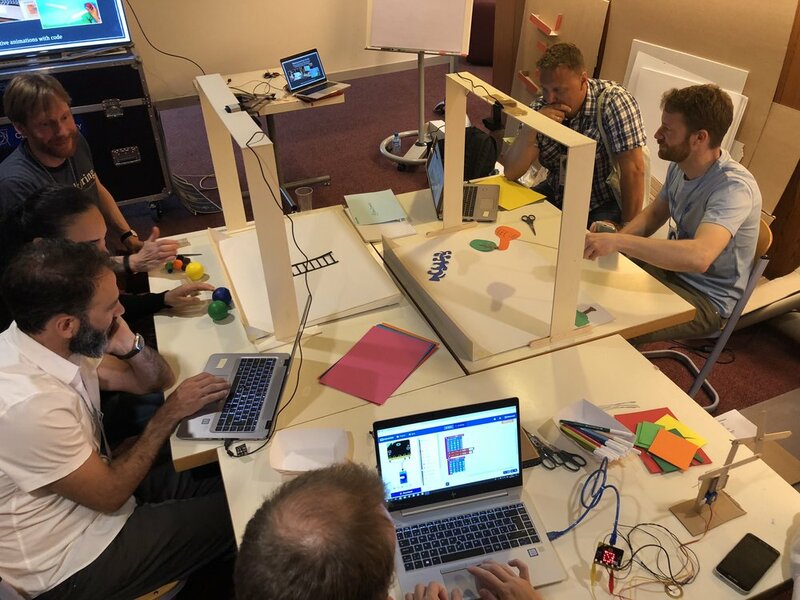 Ecsite 2018 Makerspace Recap — Wonderful Idea Co.
At the 2018 Ecsite conference in Geneva, a group of makers and tinkering from around the science center world gathered to create a pop-up environment for hands-on workshops, deep discussions about learning and lots of fun. 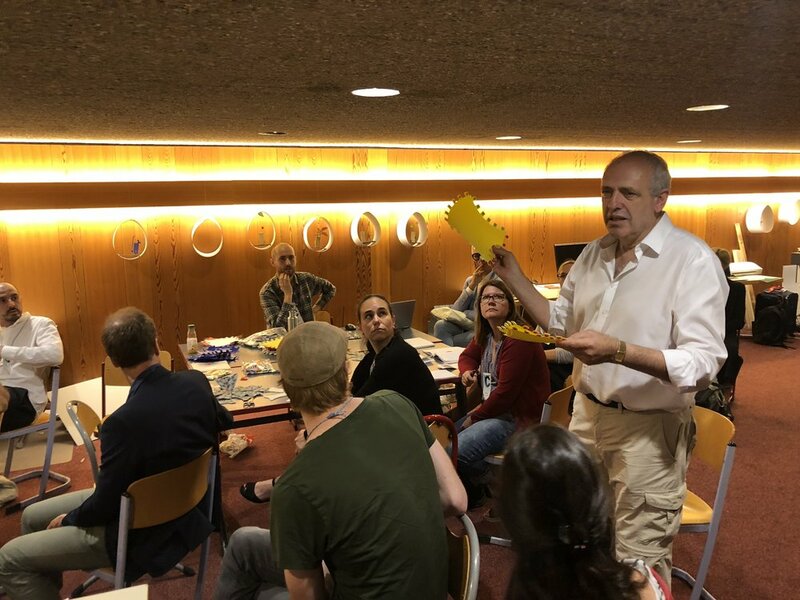 This was the sixth time that we've worked to build this unique collaborative project at Ecsite and each year we continue to connect with old friends and new collaborators experimenting about what making fabbing and tinkering looks like in science centers and museums. Two days before the conference started, we arrived in geneva and immediately went to a tiny fablab in the city center called onl’fait. This fully equipped makerspace fits everything in only two shipping containers. Cristina Olivotto, who leads the program there collaborated with our group to arrange for tools and materials. A few of us met up for dinner that night and on the way to the restaurant stumbled upon a great treasure trove of cardboard. You know that we couldn't pass up that opportunity so Vanessa, Sebastian and I ended up dragging the pile of choice tinkering materials through the streets of the city so we could bring it to the makerspace the next day. In the morning, we went to the conference center to start setting up the space at the conference. We met up with Alice from Natural History Museum who we had been skyping with for the past few months and who helped us collect the rest of the needed supplies. We arrived to a large empty open space in the basement for us to make use of to create the makerspace. First off, we started arranging tables and portable divider walls to create a separate space with a clear entrance. In the “back” of the area we set up 4 pods of tables for dedicated workshops. We set aside a place for digital and hand tools (with rubber mats protecting the floors) and we dedicated a corner up front for a display of inspiring examples that we brought and those made by visitors. With the large environmental elements out of the way, the team started working on little touches to make the space feel open and friendly. Beth worked on a hamdmade makerspace sign and Celine and Mikke worked on a digital version using a vinyl cutter. Samar created some amazing environmental pieces including a geometric string wall and a bunch of really cool hanging circle “shelves” to put creations built by workshop participants. We left excited about the possibilities for the makerspace when it was full of interesting people and projects over the next three days. For the morning session of the makerspace we arranged for a introduction to the space focusing on learning through tinkering. Sebastian gave a great overview of the “whys” of tinkering and participants built cranky contraptions as an example of an activity that exemplifies qualities like iteration, collaboration and playfulness. One cool addition to the workshop was asking participants to closely observe and then draw and label some example automata before they started to build. This resulted in a amazing collection of schematics that we could display in the makerspace for the rest of the sessions. In the afternoon of the first day, we tried an experimental session called cardboard makerspace and social inclusion that blended elements of a reflection discussion and a hands on building. Nikola, Beth and Vanessa shared ideas about their spaces and how they think about creating environments that support social inclusion, community, equity and accessibility. Participants then had a discussion about the topic and built cardboard representations of one idea that seemed interesting to them. For a final reflection we placed the cardboard creations on a shared surface and had each group explain a bit about their project. Although i think we could work a bit on the integration of the topics, it was a great experiment that I think pushed people to think a little differently and created an environment where people listened to each other a bit more than usual. The next day we led a session on computational tinkering. This was a great chance to get to test out some prototypes around three really different takes on the idea of playful, collaborative activities that use computers and computational thinking. I tried the collaborative paper circuit activity using chibitronics chibichips, Sebastian showed some of the scratch video sensing activities that are being developed by the tinkering studio and Tam and Ricardo lead a workshop on creating computer designed geometric shapes. This was a great chance to share some of the next level of tinkering experiments and new activities that will hopefully get remixed and further developed. 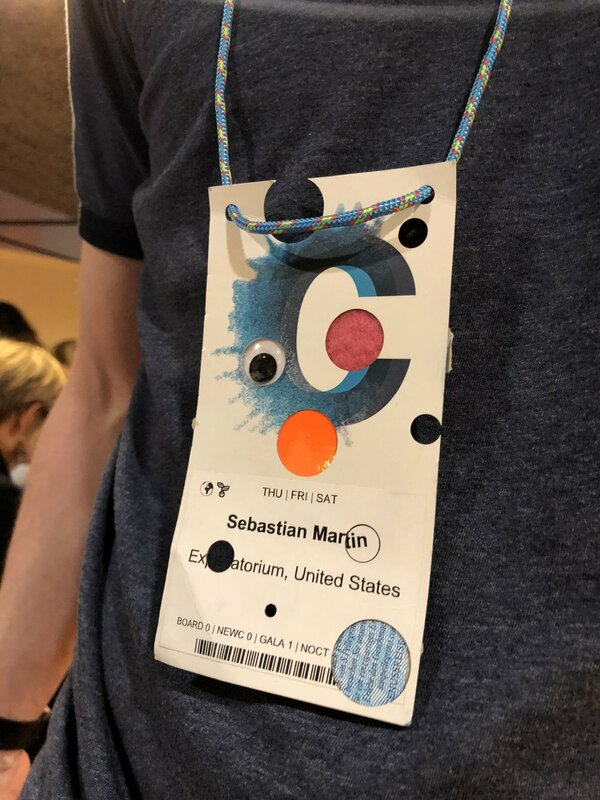 There were some times in the conference schedule where we didn't have official sessions scheduled, but we quickly filled them with spontaneous ideas like a tour of digital tools, DIY session prop construction and a super creative 'hack your badge session'. I think these informal times did a lot to create a feeling of an open makerspace that participants could check back in on and see something new or unexpected. Additionally, the formal sessions for day three with Rannei Shaz and Juanita leading a session on designing tinkering activities, a group of tinkerers from "the north" sharing maker outreach ideas, and a inspiring group of panelists from micro science centers encouraging us to "be small but think big". The final hands-on session was a really wonderful celebration of different ways of thinking about marble machines lead by Samar, Yihsuan and May. I was inspired to see how Samar created a DIY pegboard wall out of cardboard or ditched the concept of a backdrop all together for a freeform marble runs with a chair as the base! I think this open ended spirit really encouraged participants to think creatively about the possibilitied for integrating both advanced science topics and creative story telling to their projects. I think this group really exemplified the idea with a "romeo and juliet" themed marble run that ended with a pulley system that lifted the second marble. This year's makerspace was so much fun and I think was an inspiring environment for both long-time collaborators and people dipping their toes into the world of tinkering for the first time. One of the goals of the space is to show that you don't need a fancy designed fablab or a dedicated space, but with the right combination of people, projects and a playful spirit, it's possible to create a engaging makerspace. 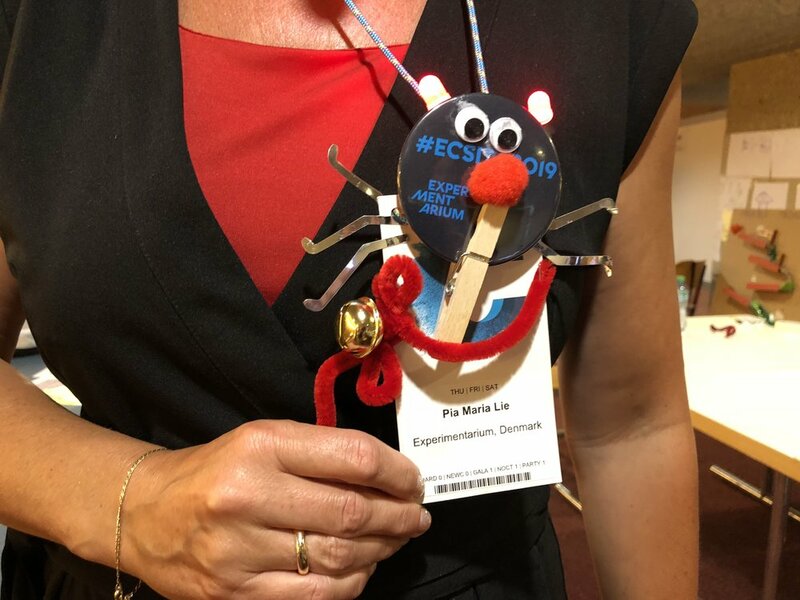 Next year the Ecsite conference is in Copenhagen, Denmark and we can't wait to see what forms this makerspace experiment takes next!